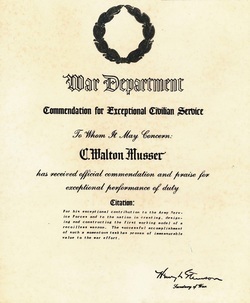 Mr. C. Walton Musser is one of the "rare individuals in whom are combined creative imagination, sound technical judgment and execution, which are reflected in his brilliant record of basic concepts reduced to practice." Mr. Musser earned many awards and accolades during his lifetime. He was an esteemed member of the engineering community and delivered many lectures to universities as well as professional societies. While he earned awards and citations for groups like American Society of Mechanical Engineers, The Academy of Applied Science and the Ordnance Hall of Fame, his most noteworthy award was granted by the US Army. It is the highest civilian award granted. This is the highest civilian award granted from the US Army.